Wow! The graph speaks volumes!! That's ridiculous!! Used about 1/4 of a large bag of Royal Oak lump. The great thing about this design is that if I ever need to add more, I can just open up the charcoal chute and pour it in. I really don't want to contemplate how much I've burned through with my leaky little horizontal offset, I'll probably just go cry in the corner. Where'd you get the sheet layout for that? I think that I'm really going to have to burn some steel next spring and build a new smoker. Ah...... *NOW* I see how it works...... It's a bit sneaky. It all depends on the crossflow out of the firebox for the size of the burn pile, and having a very well sealed fuel chamber, along with control of the air inlet. Details.... how much insulating space do you have around your cooking chamber, firebox, etc? 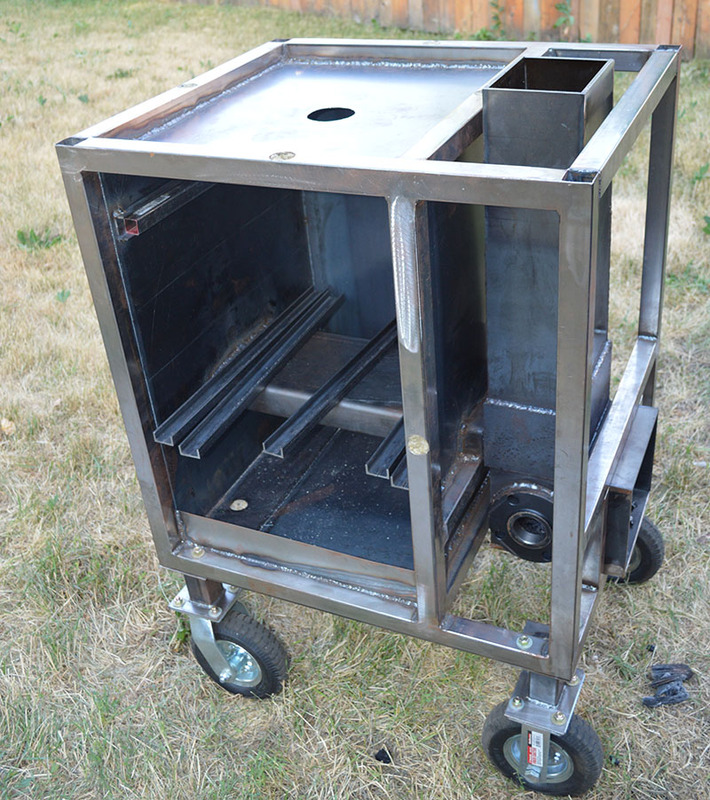 The stack flow out of your burn chamber, does it enter into the side, or bottom, of your cook chamber? How do you light it off? I'm using a Minion method charcoal basket with a chimney starter of hot coals on my horizontal offset.... well, wait..... that WOULD work, but means filling the fuel chamber after lighting the burn pile. This may make more sense. Here's a pic of the guts. The thicker metal (1/2") in the lower middle section is the actual fire box. It enters the CC through a U-channel baffle. The lower section is the air intake and ash section. This is where the smoke wood goes (smolders from ashes from coals). Since the top is sealed, the only charcoal that burns is that which is in the firebox. I bought the plans from here. A bit pricey, but very detailed. Yes, that fills in a lot of the details, thanks a bunch. No taper on your fuel chamber? Edit: that's really not all that expensive, if you can get a complete list of all of the fumbly hardware bits as well. Just chasing those could be a real time sink. Yes, there is a taper on the fuel chamber/chute. It's on the back side. Works well for preventing "bridging" of the charcoal. Ran lump just fine. Wow, that looks amazing. That graph really says it all and is a testament to what a great build you've created there!